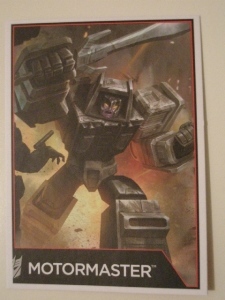 Bio: Motormaster punishes enemies and allies alike with the brute force of a tyrant, breeding fear and hatred in all who encounter him, even his Stunticon teammates. Whoop! Finally. Motormaster. Just what I needed for my pack of delinquent Stunticons, their big fatherless bully of a boss to push 'em around, keepin' 'em mean and ornery. 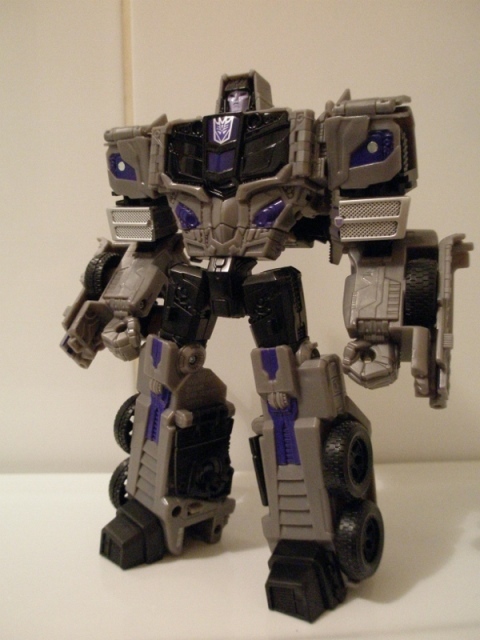 Like his fellow Stunticons, Motormaster should be an absolute cracker of a character. His bio (even the rather anaemic one his new Generations Combiner Wars toy comes with) paints him as just the worst kind of robot, a swaggering, brutal, tyrannical leader with zero people skills and one of those folk you can just tell is a wrong 'un. If he were human, he'd live on a council estate, in a grotty run-down house with mattresses and other indeterminate waste on the lawn, have some ugly looking dog that barks all the time and does huge poos everywhere and has a family of similar ne'er do wells. There would always be something kicking off, they'd look poor but have strangely flashy motors and a telly as big as my house, plus be subject to endless visits from the police and baliffs. Sadly, little of these traits have been glimpsed in any Transformers media, with everyone latching onto his Duel-esque tendencies to trounce Optimus Prime in some demented road race, which is the least interesting thing about him. Robot Mode: Look at this pile of boxes. Honestly. There's something kind of ridiculous about Motormaster. There's all these great big chunks for limbs like he's been overdoing the protein barrels, check out this massive looking body and comical crying squinty- eyed baby head in a shoe box bonce, wobbling around on the top. His fists are bigger than his entire head! The sculpted detail is fantastic, with loads of sharp jagged lines and machinery bits etched into his fantastically blocky bod. If I'm honest, it does feel a little bit over cooked, like the designers are reaching for that kind of horrible Third Party fussiness, and dialling it back a bit might have worked a little better on Motormaster's rather bulky frame. It's almost been done apologetically, to make up for how crude and simplistic he looks. This also extends to his sword and rifle, which look a bit too arty for someone as brutal as Motormaster. Unless he's the target market for those weird 'newsagents' that sell air rifles, fantasy ornaments and swords and knives that are definitely for display only, honest. The sculpting does make him very tactile and he feels great to handle and mess about with, in a totally non-weird way. His head is just way too small though, and its very distracting (especially as the bright lilac skin tone repeatedly draws your eye) but I'm not sure how this could have been improved given how the transformation works, and I suspect I'd find a slightly more in proportion head wouldn't work either. 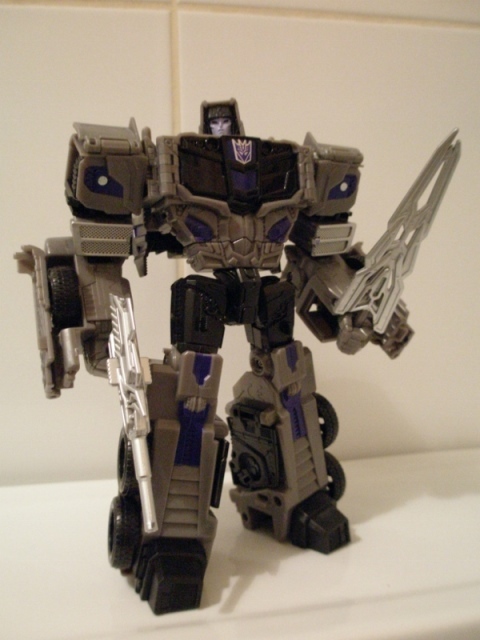 His colours are exactly what you'd expect for Motormaster – largely black and grey like the original, with some nice purple and silver highlights to break up the sea of grey. Alternate Mode: Eschewing the original's tractor-trailer combo, Motormaster is now simply a tractor cab. No big deal, but I'm sure there's a G1 purist out there wailing and gnashing their teeth about this. Unlike trailer-less Optimus toys, this works for Motormaster. It keeps the beef and threat of his robot mode and I like that. He feels pretty solid and chunky in this mode and this is also the first of Hasbro's 'clip- on wheels' vehicle modes I've found to roll pretty well (although you can see his wheels wobbling about in their housings, so marks off for highlighting the cheap construction). 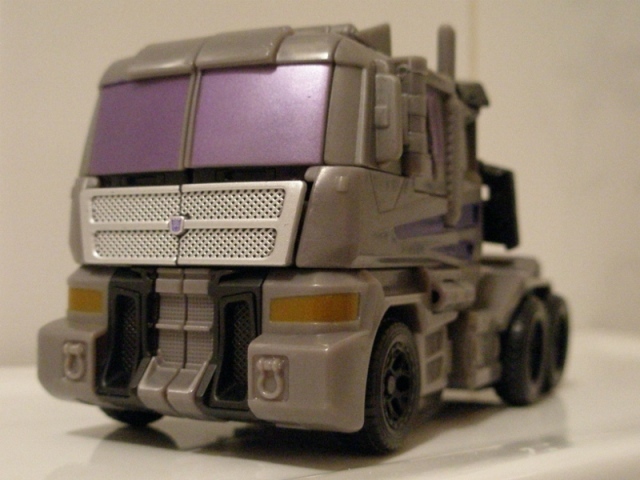 He's rendered mostly in grey plastic in vehicle mode, which is a little bit dull looking, but the flashes of silver on the grill (with nice tiny Decepticon sigil tampograph) and shimmery purple on the windscreen and flashes down the sides do enough to keep things interesting. The wheels could definitely use some silver on the hubs though, as they just look cack. Whilst I love the look and shape of the thing, I am thinking this probably would have looked heaps better with the colours reversed – so that he's a totally black cab with grey combiner junk hidden up the back. The weapons can stow on the hitch, but they look rubbish and there's no chance of an attack mode here.